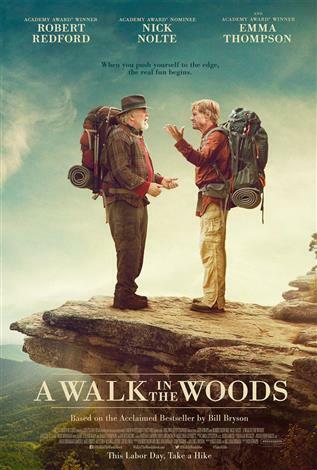 In this new comedy adventure, celebrated travel writer, Bill Bryson (Academy Award winner Robert Redford), instead of retiring to enjoy his loving and beautiful wife (Academy Award winner Emma Thompson), and large and happy family, challenges himself to hike the Appalachian Trail - 2,200 miles of America's most unspoiled, spectacular and rugged countryside from Georgia to Maine. The peace and tranquility he hopes to find, though, is anything but, once he agrees to being accompanied by the only person he can find willing to join him on the trek - his long lost and former friend Katz (Academy Award nominee Nick Nolte), a down-on-his-luck serial philanderer who, after a lifetime of relying on his charm and wits to keep one step ahead of the law -- sees the trip as a way to sneak out of paying some debts and sneak into one last adventure before its too late. The trouble is, the two have a completely different definition of the word, 'adventure'. Now they're about to find out that when you push yourself to the edge, the real fun begins.